Cohen's Advertising Scheme is perhaps the earliest cinematic example of the Jewish stereotype known as the "scheming merchant," a familiar caricature from theater and literature. This typical one-shot gag film was produced for the Edison Company by Edwin S. Porter, who had previously filmed the famous silent movie version of The Great Train Robbery. 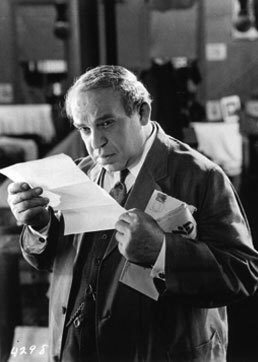 In this film, Cohen, a grotesquely made-up Jewish shop owner, hits upon a new advertising scheme: tricking a passerby to buy a coat on which he hangs a large sign advertising his store on the back. By 1907, extended stories had become popular over the single gag. In Cohen's Fire Sale, Cohen is again portrayed as the "scheming merchant." This time a new shipment of hats is accidentally picked up by the trash man. Cohen, made-up in grotesque vaudevillian Jewish style, pursues the trash wagon throughout New York picking up the hats as they drop off. When he finds the hats are not selling, Cohen reads his insurance policy, arranges for an "accidental" fire, and afterwards holds a fire sale. At the end of the film, Cohen sits happily holding the insurance policy as he places a large ring on his wife's finger. Mack Sennett's Keystone Company was famous for the style of screen farce which ushered in the work of such famous slapstick comedians as Charlie Chaplin and Fatty Arbuckle. Ford Sterling, Keystone's most popular comedian before Chaplin, plays Cohen, a sergeant in the Union Army who is the bitter rival of another officer for the attentions of Rebecca (Mable Normand). Like most burlesque Jewish characters of this period, Sterling's caricature borders on antisemitism. Yet Cohen is also the hero of the film and unwittingly turns the tide of battle. This film also boasts some of the most remarkable battle scenes of the silent era and a fascinating, unusual portrait of a female Jewish character.